Anyway, back to the salad. It's so simple, yet so perfect -- bite-sized chunks of crisp apple and chops of soft pear, tangled together. Canned mandarins make for a nice all-weather staple (They're also a bit of an obsession of mine - as a kid, I once asked for, and received, a can for my birthday). Today's salad took a special turn with the addition of home-grown raspberries. A bounty of them, in fact. Sometimes we top plain yogurt with the fruits, drizzle with honey, and recreate our own Red Mango treat from home. It happened this fall on a cold and blustery evening. Enough was enough. Bastante! I exclaimed. The orange cats scampered from the kitchen as I pounded my fist on the tile counter and vehemently reached toward the mass of cookbooks stacked on the corner shelf. Vegetarian tortilla soup would be mine. For years, the tortilla soup craze had gone on around me. I, being a non-chicken eater, was left in the wake. If only I had known it would be darn easy to bridge the gap to a vegetarian version. Since that night, this spicy, ruddy soup has been a staple in my cocina. The weather hardly matters: This one-pot meal tastes great on a chilly night as well as a sultry summer evening. The bold flavors in the base - tangy tomato and fiery chili pepper - mixed with soothing toppings like sour cream, chunked avocado, and a heap of black beans and rice are atop the near-perfect list for my palate. My concoction, like so many of my recipes, is an amalgamation of many, joined in the pot. This one calls for a dash of Rachael Ray's 30-minute version, mixed with inspiration from local takeout joint Qdoba, plus a touch of my own cooking style flair. I hope you enjoy. If using frozen "chicken," set on counter to start thawing. Put on an apron. This soup can splatter and stain. In a pre-warmed and oiled soup pot, saute onion until translucent; add garlic and cook 2 minutes more. If using vegetarian bacon, add with the garlic and saute together. Add chicken tenders approx 15-20 minutes before you plan to serve. This gives everything more time to simmer together and flavors to meld. Just before serving, toss chopped cilantro into pot. Let simmer for a couple of minutes - keeping the cilantro a bright green color. Get out your spoon; taste-test and add more salt/pepper/etc as needed. Ponder whether you want tortillas on the bottom, or top, of your soup (or both!). Then ladle soup into a large bowl. Add whatever toppings you like. In our house, we like to pile the counter with all the toppings and assemble our own. Get creative! Just had *the most amazing* gnocchi in san diego at Trattoria la Strada. Delectable dumplings in a light creamy tomato sauce. Tiramisu not half bad either! In San Diego frolicking in the sun, so this post will be brief! Last night I tasted blue crab for the first time (At least that I can recall; it's possible I had it as a child while visiting relatives on the East Coast. Mom can step in and correct me!). Heaped atop a Louie salad, it was, in a word, delicious! Nate even swears this East Coast crab is better than Dungeness... I'm not comfortable denouncing my NW roots just yet, but it was awfully tasty. Big chunks atop a crisp, cold salad of greens, cucumbers, avocado,screams summer -- especially paired with a spiffy, refreshing Rose. Followed by a soft-serve sundae in a plastic, mini Padres ball cap at Petco Park...Stayin' classy in San Diego. Also, about those Trophy cupcakes I mentioned last week... Finally made it to Trophy Cupcakes in U-Village. Oh my! The shop is dainty and darling, with personality bursting at the seams. Lots of dashing white details; very frilly and feminine. I imagine a typical conversation with the perky staff: "My girlfriend is getting married and I'm throwing her a shower and we simply *must* eat cupcakes off china while sipping tea!" If that's your scenario, go for the triple-coconut cupcake: a base of coconut cake stacked with coconut-infused frosting, and topped with layers of shredded coconut atop. It's like landing on a cloud in Coconut Heaven. I've long thought of Brussels sprouts as a fall food... they're hearty, they're healthy, and, when cooked, they emit an earthy stench common of so many autumn produce staples. And yet, this spring (creeping quickly into summer), I can't get enough of the little buds. 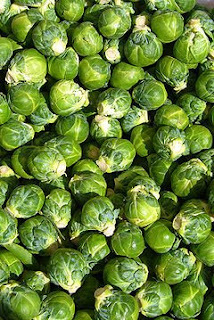 Growing up, I only knew one way to eat Brussels: steamed whole, with a little lemon juice on top to cut the intensity. That's still a great way to eat 'em--and, truthfully, the more healthy preparation. I take a handful of Brussels and chop them roughly (imagine you're slicing a carrot or leek--you want rings of Brussels), about 1/4" thick. Toss into a pre-warmed/olive-oiled non-stick skillet and cook for approx 5 minutes. Keep it on medium heat to start. Then get creative with sweeteners (just a touch) and spices. For the sweet, I've tried approx 1 Tbsp of honey or brown sugar, and think the brown sugar wins in flavor. For the spice, I like a dash of nutmeg. Continue sauteing on medium-low heat for about 10 minutes, or until the Brussels give slightly to the touch (prod with a wooden spoon, not your finger, to avoid burns!). Think "al dente" texture for pasta. Now, add a dash of wine or Marsala (maybe 1/8 C.) and let the alcohol cook off - approx 1-2 minutes. I like the rich flavor given by Marsala. Season with salt/pepper, and serve. Tasty as a side dish -- and, while I haven't yet tried it, I imagine this would also be delish when tossed with a whole wheat penne as an all-in-one meal. Also go experimental with add-ins, like chopped pistachios, slivered almonds, or dried cranberries or raisins. Num! It is with great excitement that I report the following: Trophy Cupcakes will finally open their new U-Village location tomorrow! Festivities run throughout the day, with promises of a shop stacked full to the brim with the little cups of heaven. I didn't see anything about freebies, but I can't imagine they won't offer samples. 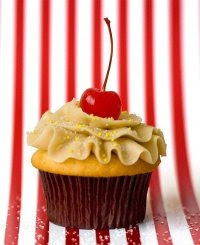 My husband is constantly baffled by how I, a non-cake-liker, can be so smitten with cupcakes. It all has to do with the ratio, my friends -- more frosting to cake = happiness for this gal. Plus, they're more moist. And there's that cuteness factor. Some say the frosting is too sweet, but I'm willing to take my chances knowing the cake itself is so moist. I plan to swing by U-V on my way home from work tomorrow to try this pineapple-upside-down flavor made especially for the opening. 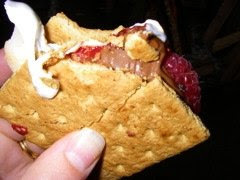 Still thinking about those gourmet smores from this weekend's campout. Toffee chocolate was a bit too rich; added raspberries to the classic setup just divine. Mad props to Lys for the idea! if you like black licorice, this is a must try! a few weekends ago, nate and i treated our moms and stepdads to brunch at our casa. the menu was divinely simple, comprised mostly of foods that could be made a day ahead so as not to feel rushed the morning-of. we ate an asparagus-swiss cheese-caramelized onion strata and some fresh fruits for the main course, chased by nate's handmade scone-biscuits and fresh strawberries. the chocolate daisies on the side came from portland's moonstruck chocolates by way of seattle's whole foods. coronado beach b & b - panama! To celebrate our six-year anniversary, my husband and I traveled to Panama for 9 days in March 2009. The highlight of our trip was our stay at Coronado Beach Bed & Breakfast, a small traveler's inn on a lovely, quiet strip of the Panamanian coast. 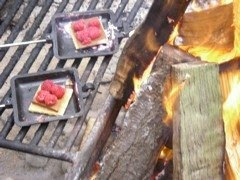 Each morning, owners Marcy and Mark served us a delicious breakfast that spared no expense in presentation, either. huevos divorciados especiales at senor moose cafe in ballard. the rojo sauce is especially fiery so make sure to reserve bites of the avocado to help temper the heat! Last summer, I spontaneously entered a contest sponsored by Molly Moon's ice creamery and the Seattle PI (RIP). The contest was to create with a fictional ice cream flavor that most exemplified the northwest. And, I won! The winning idea was a flavor I dubbed "Treecycle," a concoction of fir-infused ice cream, hazelnuts, and marionberries. I quickly devoured that $25 gift cert from Molly Moon's. I simply cannot get over their extraordinarily salty Salted Caramel ice cream made into a "s'more" sundae with homemade marshmallows and hot fudge. The balsamic strawberry is pretty top-notch, too. I only wish they'd actually made my recipe. Never say never, I hope? Here's the full article in case you're interested. doppio over ice from my tangerine dream! last week i stewed and steeped a batch of lentils with a slightly tangy tomato base and some seasonings for kick. my eyes were clearly bigger than my stomach when i was scooping those legumes into the pot, because, boy howdy!, i ended up with enough to feed an army. fortunately, Saint Inspiration waved her wand while i was sorting out just what to do with all these little brown tidbits. lentil burritos! they're wickedly simple and a nice change of pace from the staid black bean numbers i often make. load up a tortilla (i prefer the smallish, fresh ones found in PCC's refrigerator case) with a heaping scoop of lentils (cold is fine), a sprinkle of cheese (i'm currently digging the Soy-sation mexi option), and a dollop or two of toppings (i prefer Newman's pineapple salsa + a dash of hot sauce). nuke it for 45 seconds -- making sure to cover your bundle (trust me. i didn't once, and it exploded all over the microwave). pairs nicely with a Reed's spiced apple sparkling cider. the intent here at Dish is to house my current raves, recipes, and ruminations. mostly about food, with a side or two of travel when the mood strikes. stay tuned! i've got a flurry of updates planned.